Somewhere hidden within the vast, Gothic labyrinth of rooms that made up Punchdrunk and BAC's The Masque of the Red Death was a secret. Sandwiched between a sinister puppet-makers and yet another crepuscular corridor was a small door with a little Victorian poster on it advertising a side-show of diversions and amusements. Step inside and you stepped into a different world. This little space was the home to numerous miniature shows, buried like treasure inside The Masque of the Red Death. Artists were given a weekend to fix something up based on the works of Edgar Allen Poe and week to perform a piece of about 15 minutes length for audience members who would stumble upon it as they wandered curiously through Punchdrunk's mammoth installation. As I was working at BAC at the time I was lucky enough to see almost all these little shows (by companies including Kneehigh, Uninvited Guests and Blind Summit) but none was quite as charming and quietly beautiful as that made by the Paper Cinema. Huddled in the dimly lit room we watched a screen in front of us while to one side the company themselves sat, arrayed around a tiny black box and a video camera. As they delicately moved dozens and dozens of paper cutouts back and forth in front of the camera on the screen in front of us a world was conjured; a world of pirates and plague, of mysterious figures and rowdy bars, of magical journeys and impossible twists of fate. To the gentle and perfectly pitched sound of a single live guitar these sinisterly beautiful illustrations danced across the screen. The whole experience was just completely lovely. 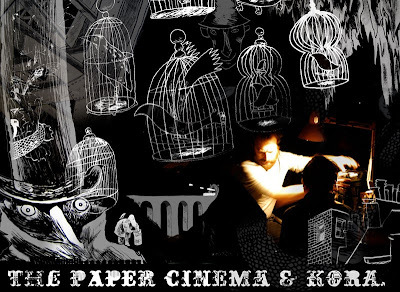 The Paper Cinema were born of the Bournemouth music scene, initially providing charming illustrations to flit across the background for a number of musicians at bars and gigs and festivals. As illustrator Nic Rawling has grown more confident in the skill with which he crafts his tiny worlds the relationship with music has slowly started to change. Now it is more frequently the music that is supporting the storytelling, subtly underscoring the action and contributing hugely to the woozy, late-night feel of this unique company. And without doubt the music is still absolutely integral, the musician in the case of the Night Flyer (their show at Forest) being the brilliant Kora. There's something hugely alluring about the whole unusual process through which the Paper Cinema make their shows. For a start the brilliant juxtaposition of Nic's laboriously hand-crafted drawings and a live-video feed from a digital camera projected onto a screen. And truly for the magic comes in the decision to tell these stories live, rather than in stop motion or other traditional forms of cartoon-making. There a beauty, in an age of Pixar and their CGI brilliance, in seeing the wobbly movements and unchanging expressions of these characters drawn on pieces of paper. But more than that in the relationship between the figures in front of you, playing guitar or waving tiny scraps of card in front of the video camera, and the action on the screen something quite wonderful occurs. We are suspended between two worlds, seeing two halves of the same action; lost in the cinematic world of the story and yet still in the room with these musicians and puppeteers. For once we are being trusted with knowledge of how its all done. The magician is quietly performing her tricks without the smoke and mirrors, and in watching her careful workings there is more meaning and beauty than when all that is concealed. After seeing King Pest, the name of the show they created for The Masque of the Red Death, I was desperate to get them to come to Forest Fringe. It was only later that I actually discovered that they had already played downstairs at the Forest previously, filling the space to the rafters for a cafe gig. Considering this prior relationship we thought they would be the perfect resident company for Forest Fringe, a regular evening slot that closed the day and sent everyone swooning into the night. Their soft, gentle style felt like the perfect antidote to the flashy bustle of the festival; a strange, alluring quietness that, like their show in The Masque of the Red Death, would provide a bubble of calm away from the loud, spectacular goings-on around them. The Paper Cinema and Kora will be performing The Night Flyer from 5-15th August at Forest Fringe at 9pm, all tickets are Pay What You Can. Paper Cinema and Kora's show was the best and most memorable thing I've seen at the fringe this year. Among a lot of overblown, self-regarding stuff this was real delight: inventive, original and beautiful. Thanks.